We often see many homes on blogs, magazines, tv shows and we often see homes that we like, some others we don’t care much about, but sometimes a place is so perfectly designed that it sticks to our mind. It becomes our dream home, our ultimate inspiration. 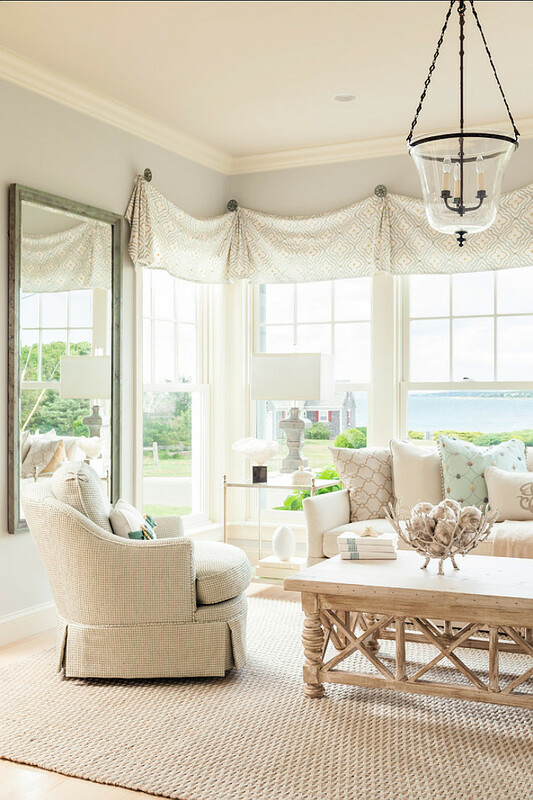 This coastal home, located in North Falmouth, Massachusetts, became a source of inspiration for the way I decorate my own and my clients’ homes. 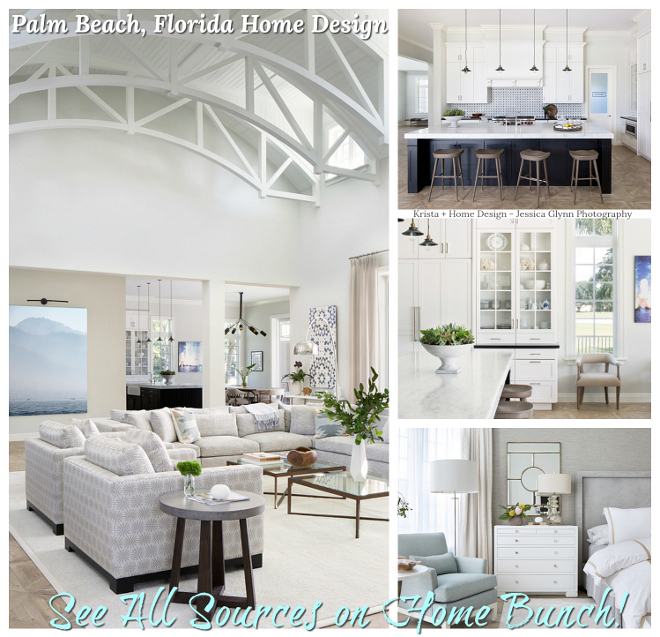 Designed by Casabella Home Furnishings & Interiors, this beautiful coastal home has one of the most peaceful color palettes I have seen. 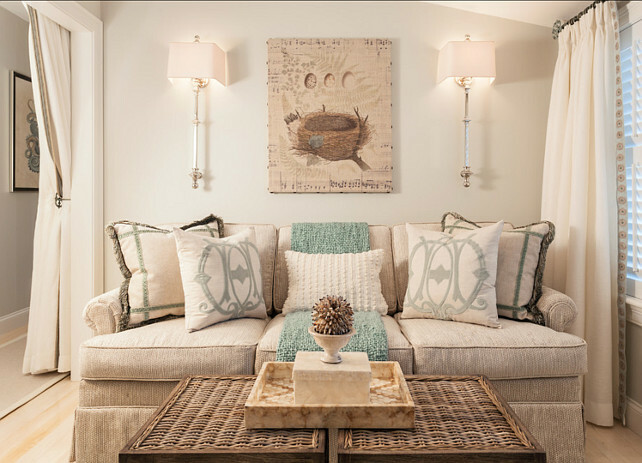 The beautiful mix of neutral colors with coastal decor make this home feel timeless and heavenly. Let’s dream and pin away! If you have some time, try to not rush through these pictures. Slow down and notice the carefully details designed by the interior designer. For example, most of the pillows are all customized and features truly inspiring design and materials. See what grabs your eyes the most in this home. 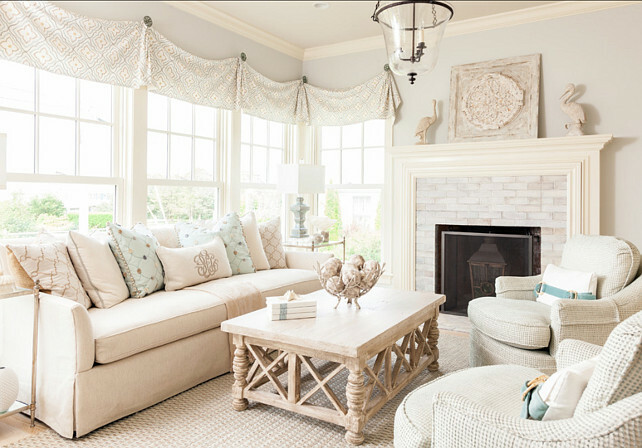 The interiors feel serene, soft, coastal and just plain lovely! Comfortable furniture invites you sit down and enjoy the gorgeous ocean view. Mirror is a one-of-a-kind and the window treatments was custom made by the designer. Isn’t this an amazing color palette? You can feel any kind of stress disappear in this room. I love the cream whites and the pale turquoise. 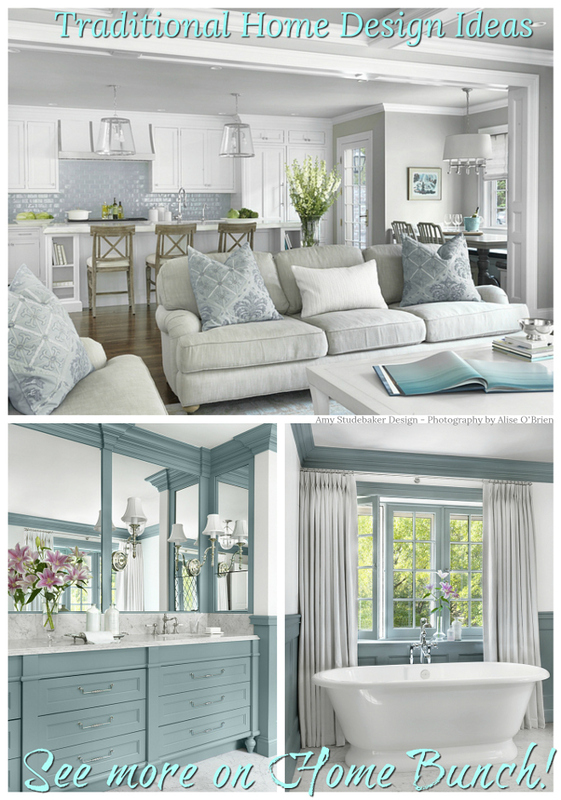 “Benjamin Moore Wickham Gray HC-171”. 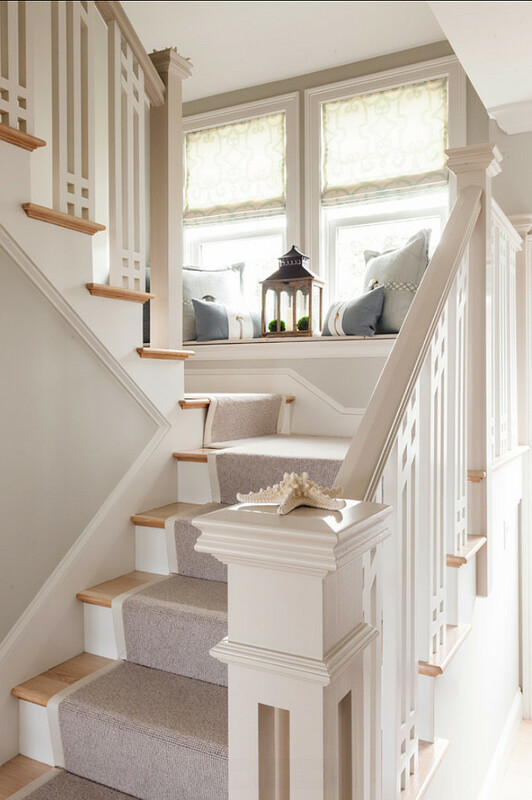 Great staircase with charming window-seat, custom throw pillows and natural fiber staircase runner. 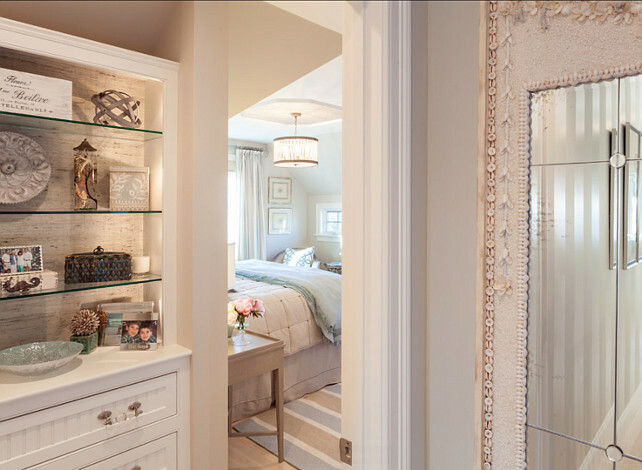 A full-length mirror was placed just before entering the master bedroom to reflect light and add personality to the hallway. 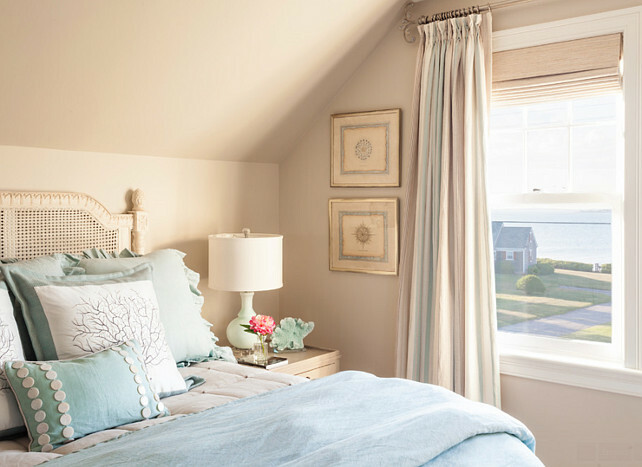 Beautiful soft colors and coastal decor continues in the master bedroom. 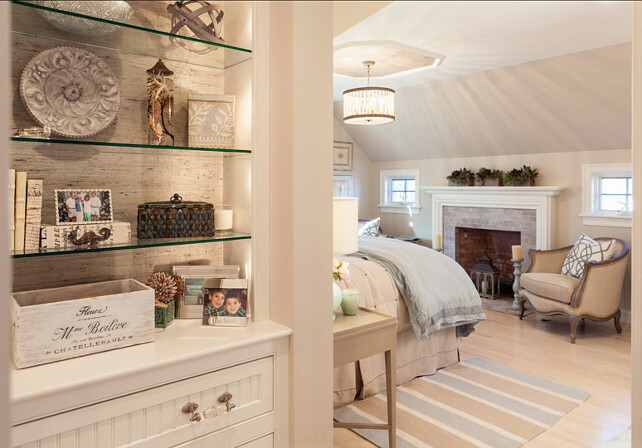 Great coastal decorating ideas for bookcases can be found here! I am loving the handles and the grasscloth wallpaper in the back of the bookcase. 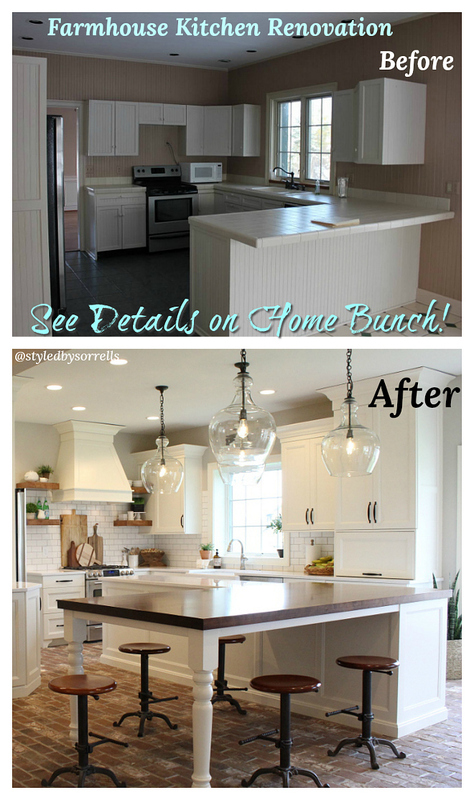 Cabinet Paint Color: “Benjamin Moore White Dove OC17”. 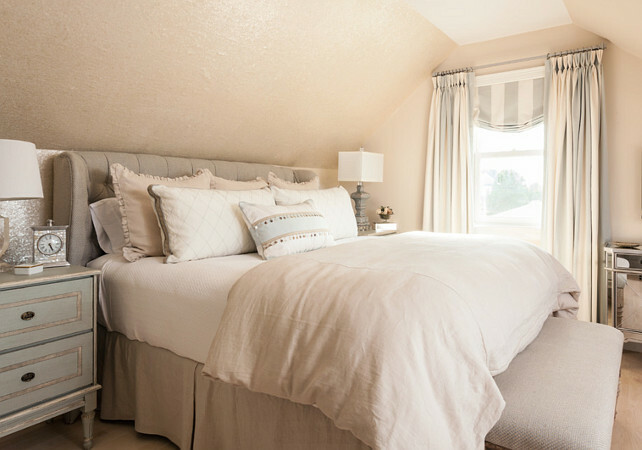 The master bedroom features a very restful approach. 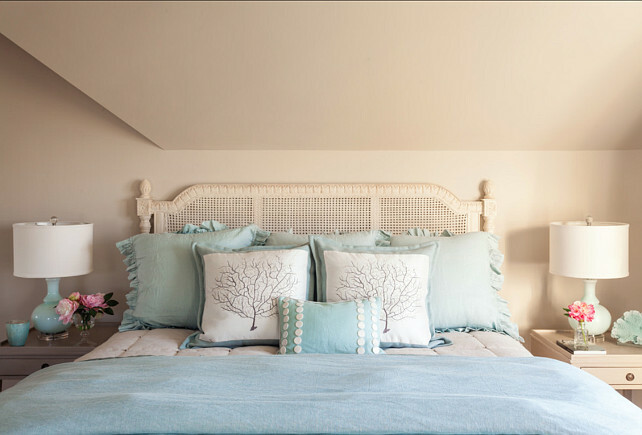 Lovely ocean views can be enjoyed from the bed in this master bedroom! 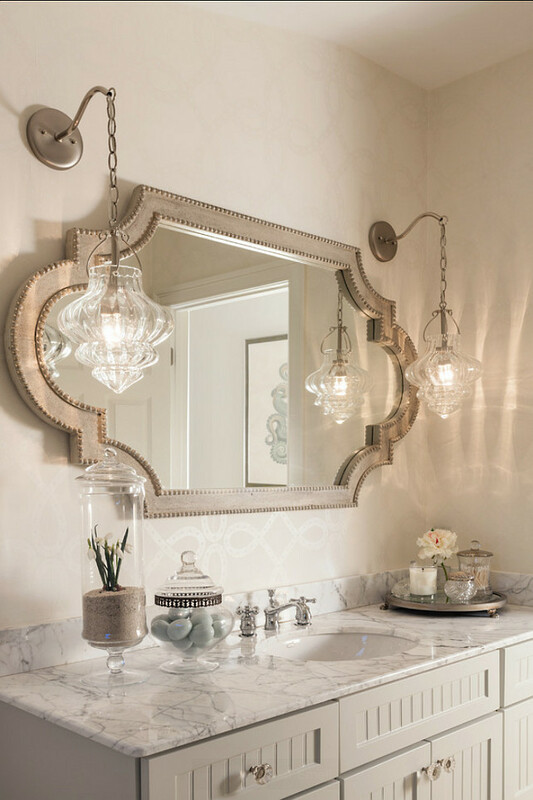 This bathroom feels very original with this mirror and the vintage-inspired light fixtures. The mirror and lights can be purchased thru Casabella Home Furnishings and Interiors. Note the very subtle wallpaper. 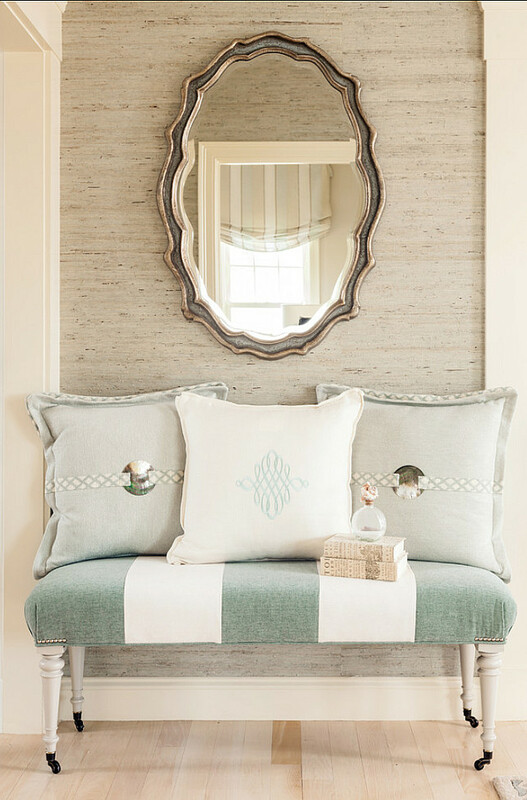 A soft coastal motif adds personality while keeping the space feeling serene. 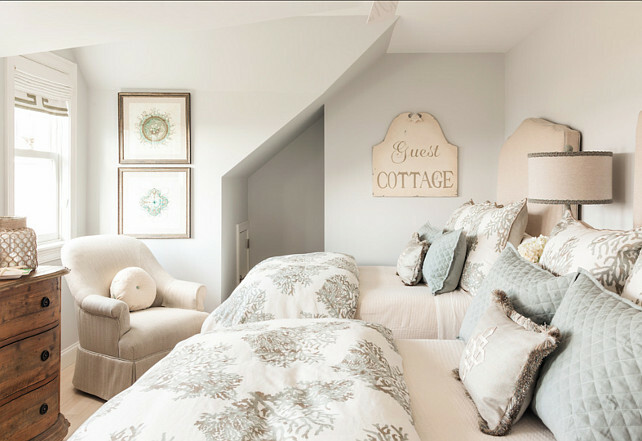 Paint Color once again is “Benjamin Moore Edgecomb Gray HC-173”. 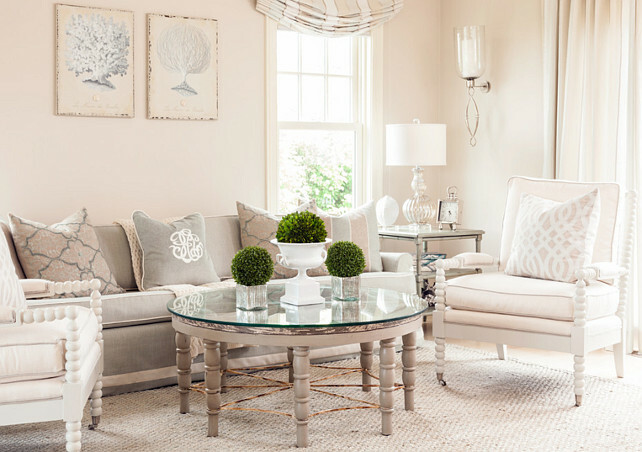 This is a very soothing, neutral color and I often recommend it to my clients. 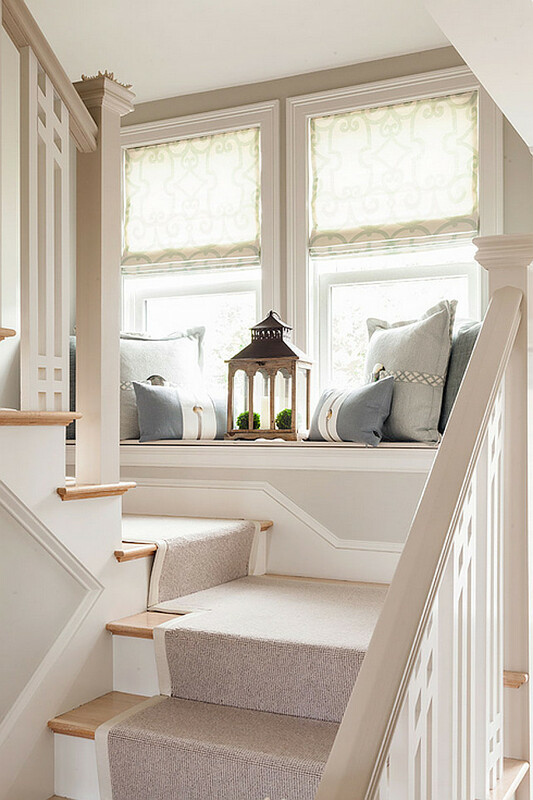 Inspiring fabrics and decor ideas! 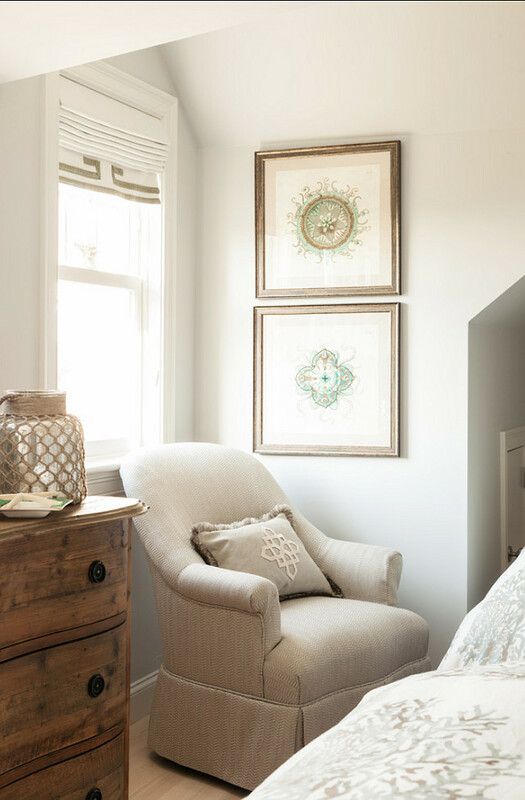 You don’t need much space to have a charming sitting area, you just need the right chair! 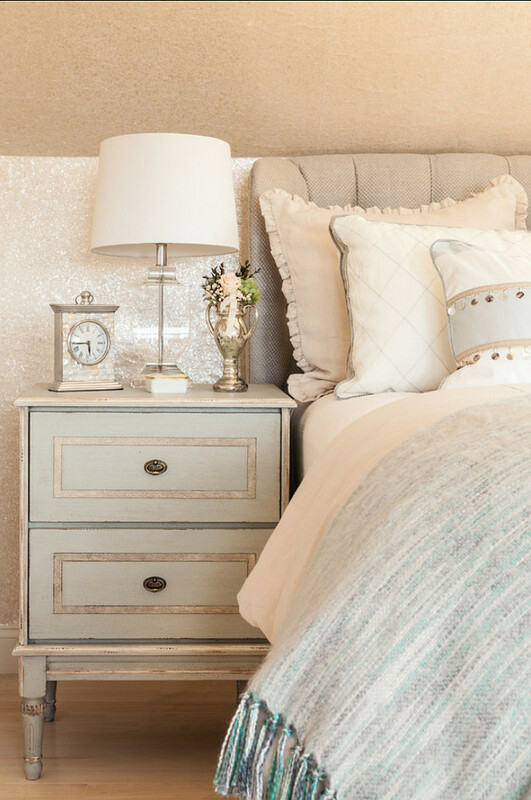 The guest bedroom reminds you of a sandy beach, with soft grays and creamy colors. Notice the custom draperies and shade. Walls are covered in a crushed sea shell wallpaper. I am loving this idea! Wallpaper can be purchased through Casabella Home Furnishings and Interiors. 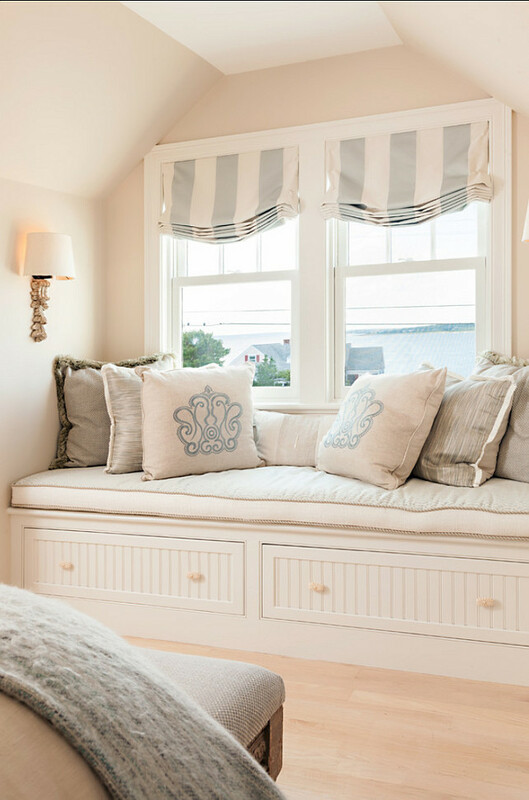 Sparkling walls and sparkling ocean views… can this room get any more coastal than this? 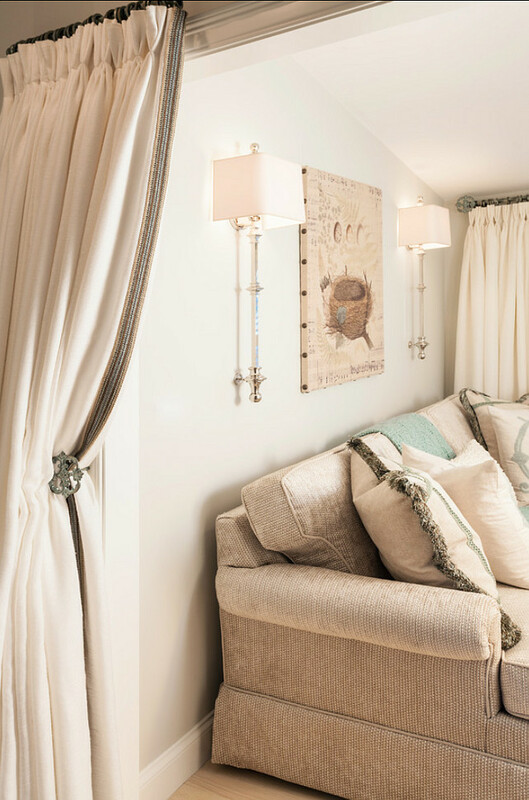 Custom draperies add privacy and make this family room feel intimate. Pillows are from “Aidan Gray”. 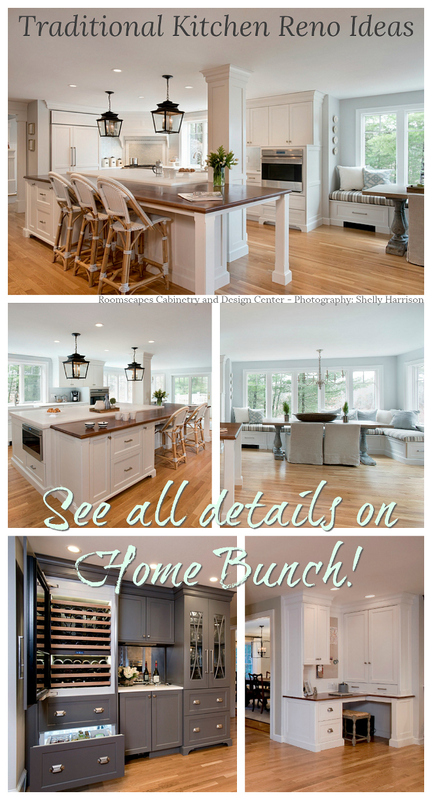 Many thanks to Michele, the interior designer, for sharing the details above! 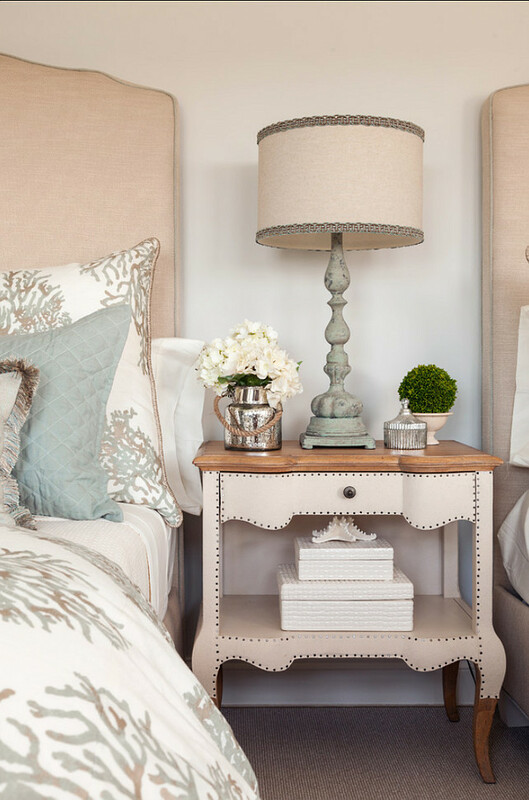 Furnishings are available through Casabella Home Furnishings & Interiors. 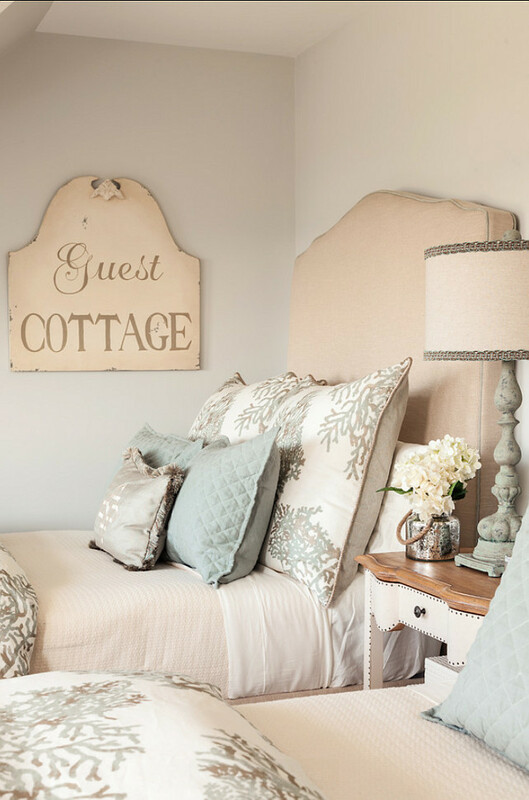 Take a look at this adorable coastal cottage, also designed by “Casabella Home Furnishings & Interiors”. I can’t believe it’s Wednesday already. It seems this week is just flying by! Anyone feeling the same way? I hope you have a wonderful day, full of health, happiness and fun! Thank you so much for being here today and I will see guys tomorrow! 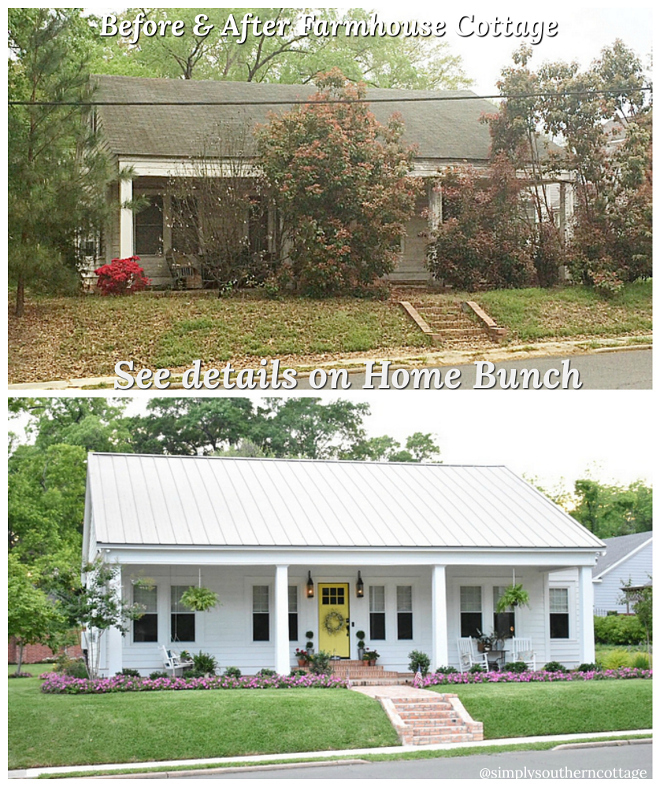 Posts of the Week: Florida New-Construction Family Home. This is so lovely! Wondering about the source for the beautiful coral motif bedding in the guest bedroom. It would be perfect in my home! what color did you paint the staircase banister. Is that titanium also? where did you find the carpet for the steps? Can you tell me where the coffee table with the turned legs is from? It’s great hearing from you! This is an older post, so I am not sure if this coffee table is still available, but if it is, the designer should be able to help you with that.